POP! 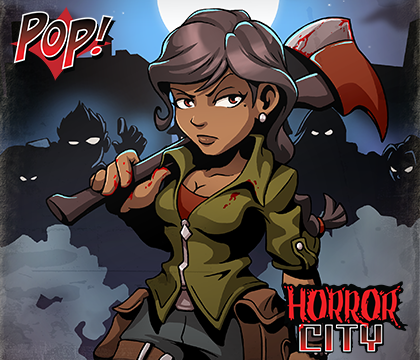 Horror City | Create Your Own Game! This stylish and pulp-fiction inspired pack contains a large mix of tiles and characters, conveniently bundled together for an affordable price. Created by Vexed Enigma, POP! 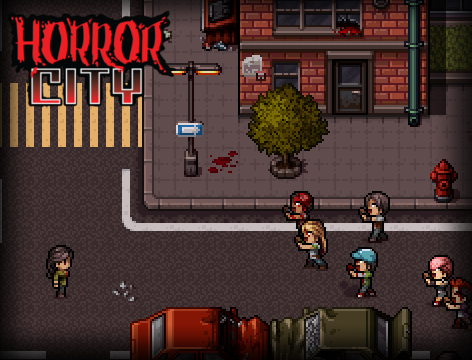 : Horror City Bundle is the first entry in a brand new series of character and environment sets. Focusing on the dark and gritty life in the modern 90's, the pack is built for modern RPGs, survival horror action, casual adventure and more. With the inclusion of multiple tile sets and character variations, this large pack is a must-have for everyone. Brand new high-quality pixel art style. 8 female and 8 male Hero character sprites, as well as zombie variants for each. Bare character bases you can use to draw your own heroes or zombies. Animated lights, door and power-up characters. 12 animated vehicles (cars), including 2 models and service cars - police, taxi. Character-matching facesets, including emotions, zombie alternatives and faceset bases. Tiles A1-A5, Tile B, Tile C, Tile D and Tile E for cityscape outside, with city life essentials and nature tiles. Tiles A1-A5, Tile B, Tile C, Tile D and Tile E for cityscape inside, with inside home essentials, dilapidated homes, office and facility settings, and more.